Lukman Haruna will not be available for selection in the next round of matches in the Ukrainian Premier League. Few hours before the close of the winter transfer market in Ukraine, the Nigeria international arrived Hoverla Uzhhorod on loan from Dynamo Kiev until the end of this season. According to the agreement between both teams, Haruna will not play against the team that owns his economic rights, Dynamo Kiev, on May 4 when they face off with Hoverla Uzhhorod, football.ua is reporting. The central midfielder has recorded 4 appearances for Hoverla Uzhhorod in the league though he has not played in the last two matches in the top flight. 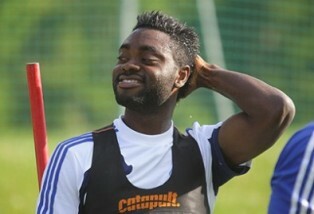 Lukman Haruna’s contract with Dynamo Kiev will run out at the end of this season.